In the McCall Group, it has almost been a tradition that as summer begins, new students join the group. Brian Tom, Kyle Crabtree, Siddhartha Bhasker, and Carrie Kauffman all began in the McCall group this way, and this year we are fortunate again to have two new students with us: Jamie Hodges and Mike Porambo. Jamie Hodges, Clemson University undergraduate student studying with the McCall group for Summer 2009. Jamie is currently an undergraduate student at Clemson University going into his senior year, and is with us on a summer research program. At Clemson, he is involved with synthesis and modification of polymers derived from animal co-products under the guidance of Dr. Igor Luzinov. Jamie has had an interest in astrochemistry since his freshman year, when an article in C&E News on astrochemistry introduced him to the field. Since arriving at Illinois, he has begun working with Kyle and Carrie on the supersonic expansion discharge source project. 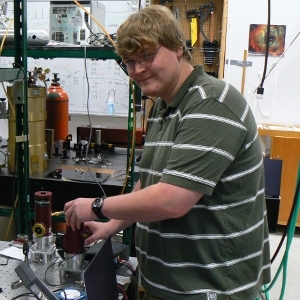 After graduation from Clemson, Jamie plans to pursue graduate studies in the field of physical chemistry. Mike recently enrolled as a graduate student at the University of Illinois after receiving a B. S. in Chemistry from Lebanon Valley College, where he studied properties and chemistry of ZnS quantum dots in the laboratory of Dr. Anderson Marsh. His interest in astrochemistry stems from a second project on which he worked as an undergraduate student: development of a temperature-programmed desorption system for studying amino acid precursors. 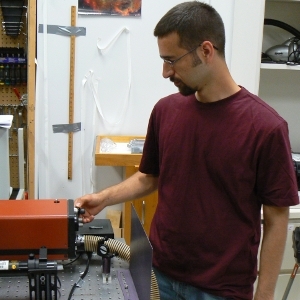 Mike's interests in the laboratory also include vacuum systems and laser technology, as well as learning about the use of high-resolution spectroscopy as a tool for studying astrochemistry. We in the McCall group welcome Jamie and Mike, and look forward to the contributions they will make!